DeAndre Yedlin says there’s a lot more to come from him at Newcastle United – thanks to Rafa Benitez. Yedlin helped the club win the Championship title in his first season at St James’s Park. He’s definitely getting the best out of me and there’s definitely more to come. And the defender, signed from Tottenham Hotspur last summer, is relishing United’s return to the Premier League. Yedlin – who played in the division with loan club Sunderland last season – feels he’s better equipped to tackle top-flight football after a year at Newcastle working with Benitez. “I think I’ve developed a lot,” said the 23-year-old. “I think he’s the kind of coach that gets the best out of every player. “He’s definitely getting the best out of me and there’s definitely more to come. Yedlin says he’s “honoured” to play for Newcastle, who will be better covered in his native United States next season. Asked if he was looking forward to representing United in the Premier League, Yedlin added: “Massively. “Newcastle’s one of the clubs, especially in the States, that you knew about growing up, because it’s such a big club. “It’s a great honour to be able to play for this club, especially going into the Premier League. Meanwhile, Jamaal Lascelles says winning the Championship title was the best moment of his career. 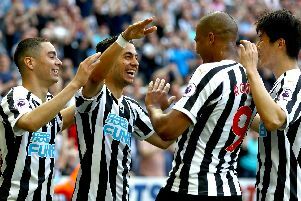 Lascelles lifted the trophy after Newcastle beat Barnsley 3-0 at St James’s Park on the final day of the season. The defender, appointed captain by Rafa Benitez last summer after the departure of Fabricio Coloccini, had missed the game itself through injury. “Hands down, it was the best moment of my career, lifting that trophy,” said Lascelles. “It’s been a tough season, a lot of ups and downs, but that’s football for you. “We got the job done. We know we have to work hard for next season, and we’ll sort that out as well. Newcastle trailed Brighton and Hove Albion by seven points last month, but Benitez’s side won their last three games. And Aston Villa’s late equaliser against Brighton, on the final day of the season, handed the title to United. “We couldn’t have done it a better way,” said 23-year-old Lascelles. “We played excellent, and then came the late equaliser down at Villa. The roar we heard was unbelievable.